Items that you find in the University Archives and Special Collections may be published (for example, a yearbook) or unpublished (for example, a letter). In both cases, your goal is the same: create a citation that will allow someone in the future to come to our repository and access the exact same item in the collections. For published material like books, yearbooks, catalogs, newspapers, and website articles, you'll want to follow the templates that your citation style lays out. For unpublished material like letters, photographs, memos, personal notes, unpublished drafts, and more, follow the instructions below. When creating a citation for unpublished materials, you will first need to gather some critical information about what you're citing. These components will then be moved around to create your actual citation. Note: your professor may require you to use a certain citation style, which may require different formatting, punctuation, or other technical specifications that are not covered here. 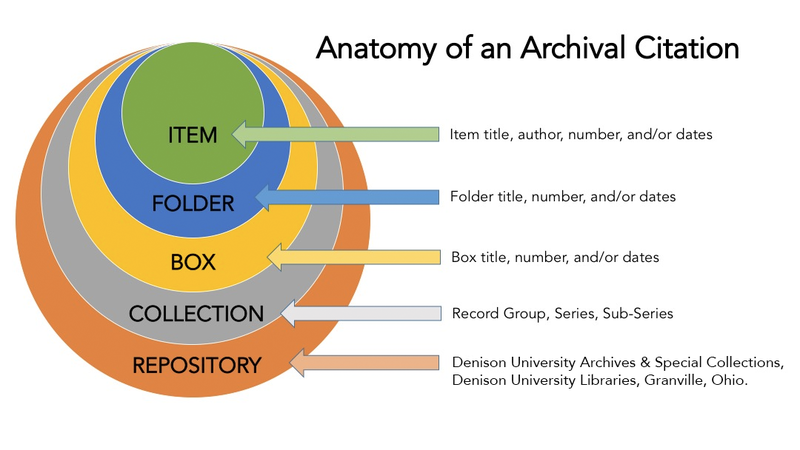 All items in an archive are physically arranged in the following order: items are found in folders, which are found in boxes. Not all items have all three of these components- for example, in some cases an item can be in a box without a folder. These items, folders, and/or boxes are what make up collections. Collections are usually classified into Record Groups, then series and/or sub-series. In the Denison University Archives, there is usually a Call Number which will tell you what the collection is. Most of the components that you need for your citation can be found on the Box Label.